Finally, you can stop hiding your smile! Missing one tooth? Multiple teeth? Dental implants take care of it all! Are you tired of constantly hiding your mouth because of the embarrassment of missing teeth? At Smiles by Design, our innovative dentist can replace your missing teeth with dental implants. While we offer multiple revolutionary implant services, let’s cover the basics of what an implant actually is. 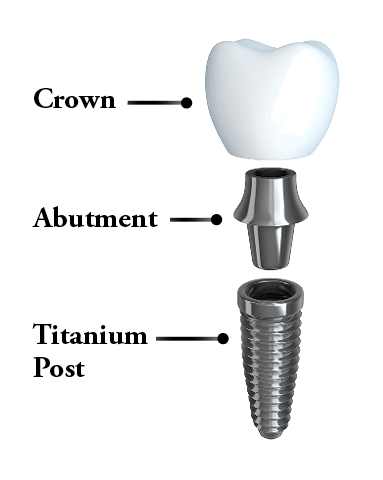 Titanium Post: A permanent post is placed within the jawbone. This post acts as the root of your new tooth, which makes it stable, functional, and durable. Then, the jawbone will start healing process and fuse with the post. Abutment: Once healed, Dr. Keller will attach an abutment, which connects the tooth to the post. Place the Crown: The crown is the last piece of the puzzle to your new smile. With their artistic eyes, our Redmond dentist will place a beautiful restoration, blending it with your natural smile. You’ll walk out of our office with a gorgeous, beautiful smile. From single implants to metal-free implants in one day, we do it all! If you’re missing a single tooth, dental implants can help restore the beauty and function of your smile. No more metal! Our ceramic implants are a fusion of comfort and function with a twist of the “wow” factor. Dr. Keller places a full arch of teeth on only four implants, which can be done in one appointment. 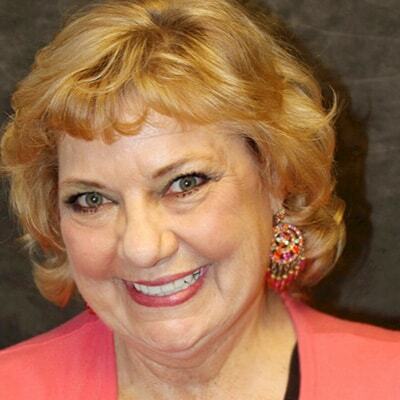 Nervous About Getting Dental Implants? See how our state-of-the-art technology makes implants an easy, pain-free experience. 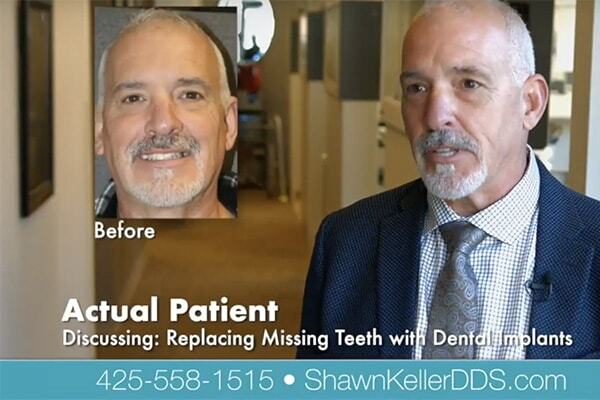 Let Dr. Keller tell you how to get a smile in one day! Let Mike tell you how this procedure changed his life. Metal-free implants are the implants of the future! Dr. Keller is the only dentist in Washington and one of the few in the country to offer CeraRoot. Made of Zirconia and ceramic, these restorations match the strength of traditional metal implants without any of the side-effects or unsightly metal showing through your gums. Our cutting-edge stem cell therapy harnesses the remarkable rejuvenating powers of your very own stem cells. Stem cell therapy accelerates tissue regeneration and helps patients heal much more comfortably and quickly. This is the same healing technology elite athletes, such as Tom Brady, have received to help reconstruct injured tissue. Lasers have changed the game for dentists who have invested in them and have the proper training to use them. Removing the need for anesthesia in most cases, they heal, disinfect, and reshape—painlessly. Ask your dentist in Redmond, WA about this new technology. 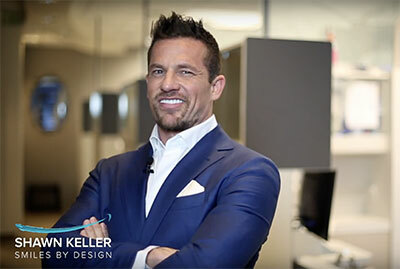 Dr. Keller is at the forefront of new advances in dentistry to ensure you receive enhanced comfort during your treatment and long-lasting restorations that look natural. No more of that nasty grit! A controlled jet of water, air, and fine powder polishes your teeth, reaching deep into periodontal pockets. It is far more efficient than traditional scrape and polish treatment – and much more comfortable. It reduces teeth sensitivity and encourages re-mineralization of damaged teeth. Ozone therapy can be used to heal and disinfect. Stubborn infections such as those around root canal teeth and cavitations can be quickly healed with ozone. Bleaching is also enhanced by ozone treatments. Dr. Keller’s guests like his use of the “Wand” computer-aided anesthesia. It is a very comfortable way to achieve numbness, removing what is usually the most anxiety-inducing part of the appointment. Most people don’t even notice when he has done it! We use Computer-Assisted Design & Manufacture (CAD/CAM) to mill crowns, bridges, and more from 3D scans. Dr. Keller is not only at the forefront of this technological revolution but is also traveling the world to instruct others on his ground-breaking techniques. Dental implants could be the answer.